This week at Jacksons Digital Expressions the theme is Breast Cancer. It is such a great cause so I am all for it. I used this cute image from JDE called Lil Roll and Bounce ll. I colored her with copics- E11,00,000, R20, 81,83,N2, 4,6,8,. The sentiment is from Doodle Pantry cut using a spellbinders fancy label. The DSP is from DCWV stack. I added SU pink ribbon, the flowers are from my stash and I added some R 81 to give them more color. Then I wanted more color so added larger rhinestones to the centers and doodled around the border of the paper. This was such a fun card to make. I will enter this into these challenges. Ink - printer, copics. white gel pen. Accessories - SU ribbon, spellbinders fancy label, flowers from stash, pink rhinestones. This is so cute Carol - & just gorgeous in "pink"!!! This is so cute and in aid of a very worthwhile cause sweetie. I saw you on MIM. Very cute card - nice image!!! Love your coloring and embellies! I saw your card at JDE and MIM. 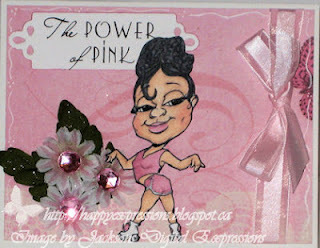 Fantastic card, love the image and pink rules..lol..thanks for the smile...and.. I love it! Thanks for sharing your wonderful card with us at Dawn's Crafting in the Breast Cancer Awareness/Think Pink challenge! Great to see your card at The Crafty Pad too! wonderful creation! Thank you so much for sharing with us at "Challenges4Everybody". Fab cheeky card Carol and so glad you shared it with us at The Crafty Pad BCA challenge ! !